Around 1,300 women in Northern Ireland are diagnosed with breast cancer every year – approximately 80% of these are over the age of 50. But it can happen to both younger women and a small number of men. 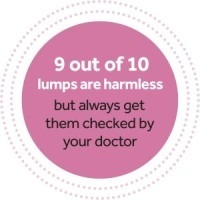 So whatever your age, being breast aware – knowing what is normal for you – makes sense. Don’t forget to check under the armpits and right up to your collar bone. Two thirds of breast cancers are discovered by women themselves. Knowing your breasts- what is normal for you – and being aware of the key signs and symptoms of breast cancer is vital for early detection. If you have a monthly period it is best to check your breasts a week after your period. Some women find that before and during their period, their breasts can be sore, tender or feel slightly lumpy which may cause unnecessary worry. If you have a breast concern, don’t delay – make an appointment to talk it over with your doctor as soon as possible. If you need to have some tests, he/she can refer you to a breast clinic for the right type of help. Of the 1,300 women diagnosed with breast cancer each year in Northern Ireland, almost a third are picked up through the breast screening service. A screening mammogram is an x-ray of your breast taken from two different angles. The screening is carried out by a female radiographer and will last no longer than five minutes. All women between 50 and 70 are invited every three years for free breast screening. If you are over 70 you won’t receive a postal reminder but it is important to continue to make appointments with your local screening centre. You do not need to have any symptoms to use this service. Remember it is important to be breast aware in between your appointments. Early detection & screening saves lives! Download our information leaflet on breast cancer here. If you have any concerns about cancer you can talk to one of our specialist nurses on the Cancer Focus NI free information and support NurseLine on 0800 783 3339 (Monday – Friday, 9am – 1pm). You can also email us on nurseline@cancerfocusni.org.